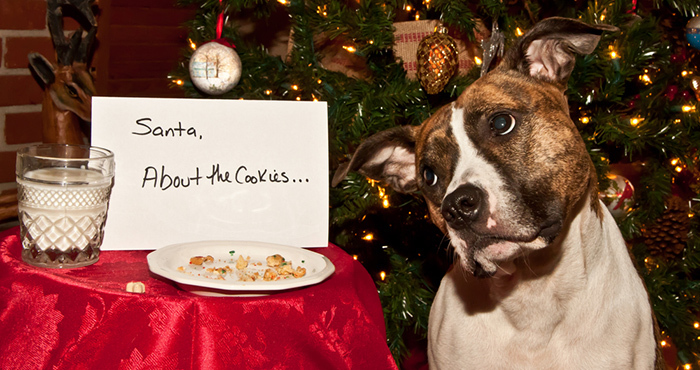 If you’re lucky enough to have a dog, then they are a huge part of your Christmas. Wrapping up warm to take them for walks; falling asleep with them by your feet in front of the fire; and them getting just as excited as you when your friends come over! We’ve put our love of dogs and skills in the kitchen together and come up with a recipe for Christmas cookies that your furry friend will love. Preheat the oven to 150˚C/130˚C fan/gas mark 2 and line two baking trays with parchment paper. Add the wholemeal flour, oats, dried parsley and crunchy peanut butter, followed by the egg. Mix well to combine and allow to sit for five minutes. Roll the mixture out to about 1cm thick and cut into festive shapes with biscuit cutters. Place on the prepared trays and bake for 40-45 minutes. Allow to cool completely, then store in an airtight container and treat your dog to a homemade biscuit once a day…that is, *if he’s on Santa’s good list! *It is important to note that all dogs are good dogs and therefore you should probably make a batch of these cookies!